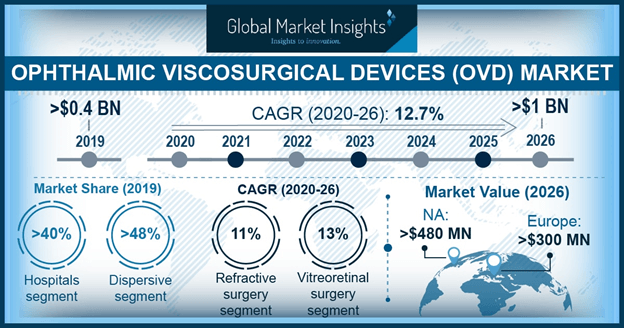 Ophthalmic Viscosurgical Devices (OVD) Market size was valued at USD 353.0 million in 2017 and is expected to witness 12.3% CAGR from 2018 to 2024. 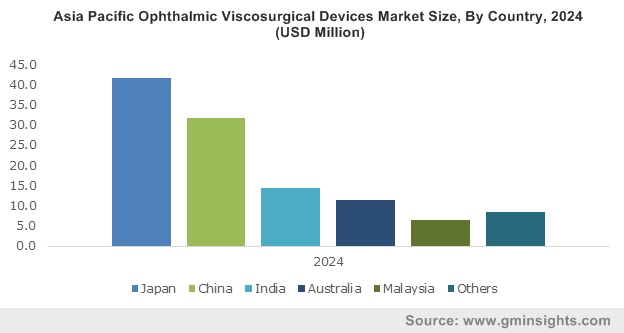 Increasing prevalence of ophthalmic diseases coupled with rapidly growing diabetes burden worldwide is the key factor driving ophthalmic viscosurgical devices industry growth. According to the World Health Organization report, more than 285 million people worldwide have vision impairment, and 42% due to uncorrected refractive errors. Furthermore, myopia is estimated to affect half of the global population by 2050. Such factors will surge the demand for technologically advanced eye surgeries thereby, augmenting OVD industry growth. Moreover, growing geriatric population base, advancements in healthcare infrastructure and rising healthcare expenditure will further drive business growth. Technological advancements in ophthalmic surgeries will positively impact OVD business growth in coming years. Increasing patient preference towards non-invasive and advanced treatments such as laser-assisted vision correction surgeries such as LASIK will spur OVD market size in coming years. However, high costs coupled with risks associated with eye surgeries may hamper industry growth to certain extent in developing and under developed countries. Post operational risks associated with ophthalmic surgeries including visual aberrations, development of chronic dry and red eyes, over or under-correction of vision and infection may impact negatively on OVD industry growth. Refractive surgery segment was valued at USD 34.0 million revenue in 2017 and will witness robust growth over the forecast period. Surge in the number of people affected by myopia will lead to refractive disorders thereby, escalating demand for refractive surgery. According to International Myopia Institute (IMI), an average 30% of the global population is currently affected by myopia, and the number is projected to reach 50% by 2050. Moreover, availability of technologically advanced refractive surgery devices such as excimer lasers and femtosecond lasers will further favour segmental growth. Vitreoretinal surgery segment will witness lucrative CAGR of 12.6% during the analysis timeframe owing to rising prevalence of vitreous and retinal diseases across the globe. According to British and Eire Association of Vitreoretinal Surgeons (BEAVRS) about 50% of the patients requiring vitreoretinal surgery are emergency cases including eye trauma and retinal detachment. Increasing prevalence of sight threatening conditions such as macular hole, epiretinal membrane and diabetic retinopathy will propel segment growth in coming years. Hospitals segment held significant revenue share of 44.8% in 2017 and is estimated to grow during the forecast period. Segmental growth is attributable to growing disease burden across the globe. Availability of high-tech equipment and technologies in hospital settings will surge the number of surgeries being performed thereby augmenting business growth. Clinics segment was valued at USD 123.8 million in 2017 and will witness significant growth by 2024. Increasing number of cataract procedures in developed and developing countries will favour segmental growth. High adoption rate of advanced ophthalmic devices required in various minimally invasive Lasik procedures should escalate segmental growth over the forthcoming years. North America OVD market dominated the global market with 48.8% revenue share in 2017 and is expected to witness similar trend over analysis period. High growth is attributed to rising incidence of ophthalmic diseases such as visual impairment and blindness, refractive errors and eye injuries in the region. According to American Academy of Ophthalmology’s Eye Health Statistics, cataract affects around 24.4 million Americans aged 40 years and above whereas glaucoma affects over 2.7 million in 2015. Increasing prevalence of such diseases will spur North America OVD market size over the forecast period. Asia Pacific OVD market is estimated to show lucrative CAGR of 14.6% over the forecast timeline attributable to rising prevalence of diabetes in the region. Growing prevalence of diabetic eye diseases including diabetic retinopathy, cataract, diabetic macular edema (DME), and others will render positive impact on the regional growth. Discovery and development of ophthalmic viscosurgical devices can be dated back to 1934, when hyaluronic acid was isolated as the substance of the vitreous body of human eye. Sodium hyaluronate, the first substance used as an OVD and is now the most commonly used material for ophthalmic viscosurgical devices used in eye surgeries. The first licensed OVD, Healon (sodium hyaluronate 1%), was developed in 1979 by Pharmacia. Healon was launched and became commercially available by 1980 and received U.S. FDA approval in 1983. 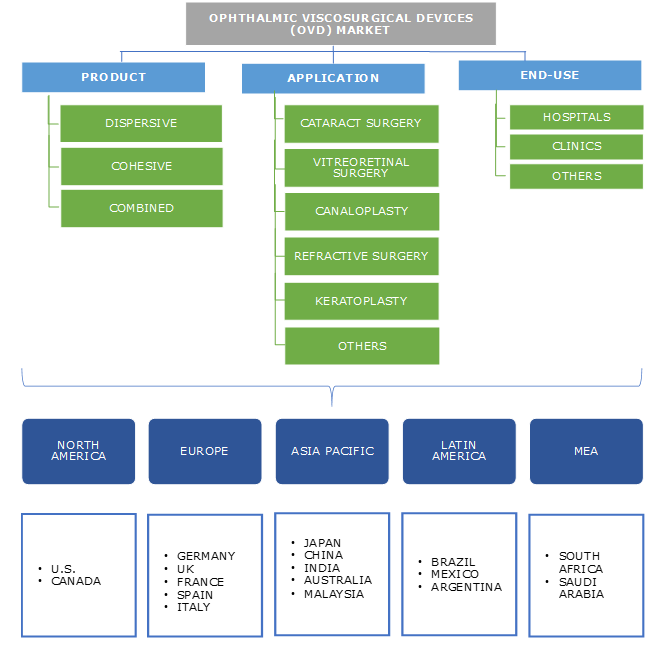 Later, an international standard for the safety, performance and approval requirements for viscoelastics was developed under a new designation of ophthalmic viscosurgical devices (OVDs). Since the introduction of Healon, OVDs have become an essential tool in various ophthalmic surgeries such as anterior segment surgery. Introduction of OVDs had an influence on the evolution of phacoemulsification and extracapsular surgery such as reduction in incidence of corneal edema. Thus, OVDs have a great impact on the success of intraocular lens implantation and cataract surgery. Today, use of OVDs have substantially increased for cornea, cataract, trauma, glaucoma and vitreoretinal surgeries. Thus, ophthalmic viscosurgical devices industry is projected to witness lucrative growth in the coming years.